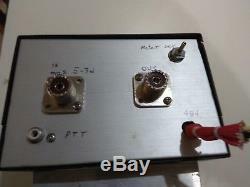 450-500 W 144-148 MHz linear power amplifier. 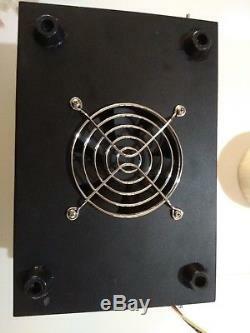 A solid state high power VHF linear amplifier built on newly designed circuit. 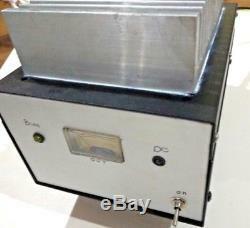 This unit will be a great 2 meter linear amplifier for VHF SSB DX or moon bounce work. The circuit features an LDMOS in a push-pull circuit built on a good ROGERS laminate (VHF , UHF, MW) and copper heat spreader with a good ground plane. The amplifier is constructed using the best quality components and the bias circuit had been developed to employ modern devices (3 leg) and a current source combined to provide exact control of output bias to the gates of the final transistors. Temperature tracking of bias is employed where the sense device (Thermistor) is physically mounted on the bases of the power Mosfet device. My tests have shown that the circuit is very stable at all power levels. Up to 5W input yields 450-500 W out on a 50 ohm dummy load at 48 V. The current is about 20-22A. Idling current can be adjusted with a variable resistor on board for class AB operation. The bias circuit is switched on/off to allow stand-by/receive operation. 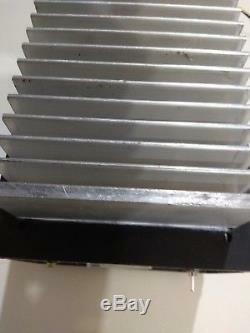 The PCB is mounted on a heavy duty tapped heat sink and copper heat spreader for cool and reliable operation. Input and output matching is made with rigid transmission lines in a classical "Z" transformers. All RF caps are ATC. A full description will be included with the unit. Built int an pro box with SO239 connectors and BNC and an RCA connector for PTT control (with minimal load on the circuit driving PTT in your radio). On the panel and all required relays inside the case. 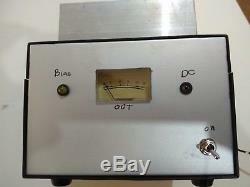 Relative output lighted front panel ANALOG meter. Size: 210 x120 x90 mm and about 2.5 lb. Installation is easy making this is a great unit to fill all your VHF amplifier requirements. Please verify your address during checkout. We are not responsible for any wrong or undeliverable addresses. Items will be checked carefully before sent out. Thank you and 73's. Skype: I can be reached at: baruch4z4rb. The item "2 m 450-500 W LDMOS 144-148 MHZ linear amp" is in sale since Thursday, October 11, 2018. This item is in the category "Consumer Electronics\Radio Communication\Ham, Amateur Radio\Ham Radio Amplifiers". The seller is "4z4rb" and is located in ISRAEL. This item can be shipped worldwide.